[Simple Twist Of Fate] conjures the smell of the air on an early spring morning… Dylan on this album has become a master of textures. “Simple Twist of Fate” unmistakably creates the time, holds it, breathes it in, and stops it; the tools it uses to accomplish this arc storytelling, imagery, phrasing, timing, vocal texture, rhyme, melody, and ensemble sound. The bass playing (content, timing, attack) is revelatory. The harmonica solos sum up the song’s essence and push it out to the furthest corners of the universe. As ‘Girl From The North Country’ had been triggered by the breakup with Suze Rotolo, casting him back to an older affair, so ‘Simple Twist Of Fate’ set him reflecting not on Sara, but on Suze – hence the song’s subtitle in the notebook, ‘4th Street Affair’. @ #49 on my list of Bob Dylan’s 200 best songs. He’d already started changing the lyrics when he debuted it @ WTTW-TV Studios, Chicago, Illinois – 10 September 1975. About that simple twist of fate. 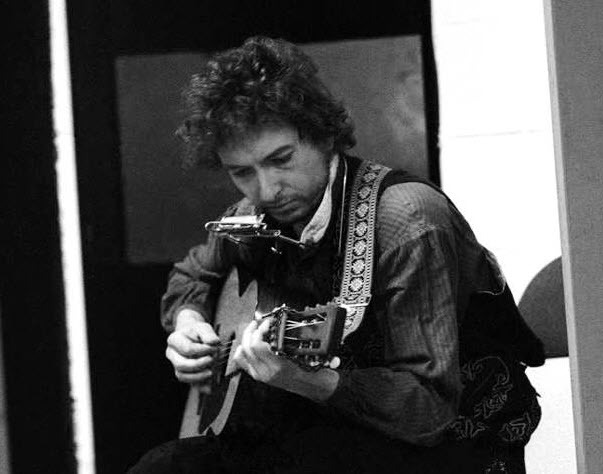 In 1987 Dylan started performing the original lyrics of all the “Blood On The Tracks” songs he still played in concert. And still, vestiges of the song’s beating heart remained well into the Never Ending Tour, Dylan rarely failing to invest this, one of his most personal songs, with power and passion. [Simple Twist Of Fate is] another track that seem to loop around itself in endless recurrences. A movie you can watch in your mind every time you hear the song. The bare rendition suits the words, as does Dylan’s extraordinary reading, picking out every syllable and singing as if in a reverie. She should have caught me in my prime. And leaving me to meditate. Wow, thanks for the awesome alternate version!